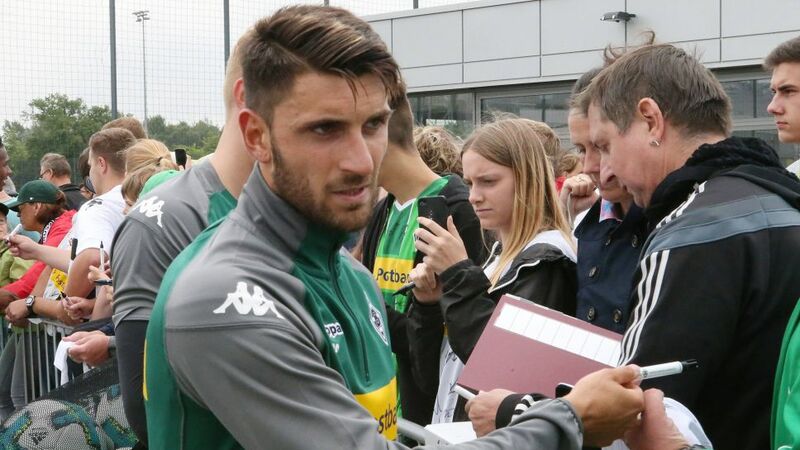 Bundesliga | Vincenzo Grifo: "Borussia Mönchengladbach move a dream come true"
Vincenzo Grifo: "Borussia Mönchengladbach move a dream come true"
Given the unexpected success of RB Leipzig and Hoffenheim in the Bundesliga last season, Freiburg's achievement in finishing seventh as a newly-promoted side was often overlooked by headline writers. Their feat was no less remarkable, however, and attacking midfielder Vincenzo Grifo was an essential part of the team's charge into the UEFA Europa League qualifying rounds, scoring six and providing eight assists in an outstanding campaign. That caught the eye of Borussia Mönchengladbach, who signed the 24-year-old earlier this summer. In an exclusive interview with bundesliga.com, Grifo discusses his transfer, career trajectory and why he looks up to Real Madrid star Cristiano Ronaldo. bundesliga.com: Vincenzo Grifo, you have been training with your new team-mates for a few days now. What are your first impressions? Vincenzo Grifo: It's been five days but it already feels like I've been here a lot longer. That's down to the fact that everybody's given be a really warm welcome and has helped me. And I don't think I'll upset anyone by saying that everything's a bit bigger here than it is in Freiburg: the stadium, the changing rooms and the media presence at training over the first few days. I dreamed about playing for a big club like this ever since I was a little boy. And now it's come true. bundesliga.com: Are you reserved when meeting a new group of team-mates, or are you more open? Grifo: Generally I'm not the kind of person who's fearful or who gets nervous easily. And football is what I love doing, it's my dream job. When I'm playing I can rely on my ability, but having said that I'd by lying if I said it's all business as usual when you join a new club. You have to learn how things are done and get to know the people who work here. It's helpful to have your team-mates by your side for all that. Grifo: Jannik Vestergaard and Fabian Johnson haven't returned to training yet but Tobias Strobl really helped me a lot over the first couple of days. But everyone else has also made it easy for me to settle at Borussia, be it Nico Schulz [before his own recent switch to Hoffenheim], Christoph Kramer or members of staff – such as the kit-men. There's only one at Freiburg but there are three of them here. Grifo: I've never played in Europe and I won't deny that it's an ambition of mine to play in European competition one day. But even though we won't be there this season, in recent years Gladbach have shown what they're capable of. And everyone here knows they can do better than last season. We'll do everything we can to qualify for Europe this term. My decision to join Gladbach was primarily down to me wanting to take the next big step in my career. You can't forget that I was playing for Pforzheim just six years ago [Pforzheim compete in the fifth tier of German football], and now suddenly a club like Gladbach are interested in me. It couldn't get any better than that. I'm as excited as a kid looking forward to playing my first game at Borussia Park in front of 55,000 fans. Watch: Grifo's chip against Mainz last season gives a taste of what he can do! bundesliga.com: And what have you made of the quality of the team out on the pitch? Grifo: They can play (laughs)! They're all really good players and it's a lot of fun to play with them, and not everyone's back yet. I'm already looking forward to seeing what this team can do when everyone's back in training in two or three weeks. bundesliga.com: How much of an impact did Freiburg coach Christian Streich have on your development? Grifo: Even though Freiburg had been relegated to Bundesliga 2 I had a good feeling from the very start. I'm the kind of person who likes to go with my gut instinct. And playing in the second division with Freiburg and Christian Streich, scoring lots of goals and getting assists, was like an explosion. Nevertheless, I was still a little bit unsure whether I could do the same in the Bundesliga. Thankfully it worked out well there too – thanks in large part to Streich, who helped me develop a great deal. It was also really helpful that my family was so close by. Freiburg and Pforzheim aren't very far away from each other. Grifo: That's true, but I'm not 21 any more, I'm 24. I think I've matured as a player and as a person over the last few years and now I understand a bit better how things work in life. And I have the feeling I can keep progressing in Gladbach. That's certainly my objective. bundesliga.com: You'll wear the number 32 shirt at Gladbach, just like at your previous clubs. Are you superstitious? Grifo: Yes. If the 32 shirt hadn't been available that would've been a bad omen [laughs]. Everyone's got their own rituals in football. For me, the number 32 has always brought me luck, be it playing bingo or cards. When I moved to Dresden from Hoffenheim I had to wear the number 19 shirt – and we got relegated. So I did everything I could to wear 32 at my next clubs. It worked out really well in Frankfurt and Freiburg, so it could only be 32 at Gladbach too. bundesliga.com: In the season Freiburg got promoted, you earned the nickname "The Ronaldo of Bundesliga 2" due to your prowess at free-kicks. Who came up with that? bundesliga.com: Did he not know that Ronaldo has hardly scored any direct free-kicks in the last few seasons? Grifo: That's true, but when he was at Manchester United and in his early years at Real Madrid he regularly scored from free-kicks. It's definitely an honour to be compared to him. bundesliga.com: Is Ronaldo a role model of yours? Grifo: Cristiano Ronaldo and Lionel Messi, both of them are absolutely world class. Perhaps you can say that Cristiano is more of a hard worker and that Messi has more talent on the ball, but Cristiano has shown what you can become if you work hard – maybe even harder than everyone else – every day. Even after a fantastic camapign in which he scored 50 goals or more he still throws himself into the next season and never rests on his laurels. That attitude is definitely worth using as an example. bundesliga.com: You are able to play both on the wing and in a more central role. Given how dangerous you are in front of goal, do you prefer the latter position? Grifo: It largely depends on how you link up with your team-mates. It was virtually perfect in Freiburg. Generally I like to play as a number 10 but I've got absolutely nothing against playing wide on the left, going one-on-one with my marker and then going for goal. At the end of the day, it's up to the coach to decide. bundesliga.com: You were born in Germany but have Italian citizenship. Have you ever been interested in playing for Germany at international level? Grifo: Not really, to be honest. I played for the Italy U-20s and it's still my dream to represent the Squadra Azzurra at senior level one day. That said, I feel very much at home in Germany and am happy that I grew up here and was able to learn of lot of typical German qualities, like discipline, punctuality and reliability. Nevertheless, at home we always spoke Italian, ate Italian food and lived like Italians. Simply put, my heart beats for Italy. bundesliga.com: Have you already had any contact from the Italian national team? Grifo: Yes and I hope there'll be contact in the future too, especially as I'll be playing at a big club now. Our captain Lars Stindl has just shown that it's still possible to be called up to the national team later in your career, as long as you perform for your club. At the end of the day it's up to me to make my dream come true. Click here for more Gladbach news!